Working as a police officer can be a highly stressful and even dangerous job. However, if you seek justice and like adventure in your life becoming a police officer can be a rewarding career for you. A formal education in law enforcement, criminal justice, psychology, or military training can offer the greatest opportunities. 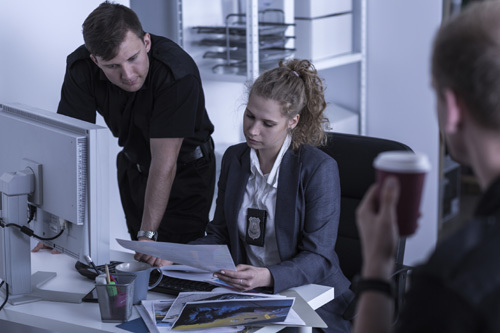 There are many different careers within the law enforcement profession and this career zone only covers a career as a police officer or detective. Take our Police Officer and Detective career assessment. This 30 question quiz let’s you know if you’re cut out for a career as a police officer or detective by analyzing your abilities, skills, and interests. 1. Are you comfortable with the idea of providing testimony as a witness in court? 2. Would you be OK securing a deceased body and obtaining evidence from it until a medical examiner arrived? 3. Could you picture yourself examining a crime scene to obtain clues? 4. Would you be OK obtaining evidence from suspects? 5. Are you OK recording the progress of an investigation and submitting reports to a commanding officer or others in supervisory positions? 6. Does the idea of learning about laws, legal codes, court procedures and agency rules sound OK to you? 7. Would you be interested in gaining knowledge of relevant equipment and policies to promote security operations? 9. Do you have knowledge of human behavior and performance? 10. Are you up to the task of meeting or exceeding customers/clients needs? 13. Can you use logic and reasoning to approach problems? 15. Do you have the ability to understand written sentences in work related documents? 16. Can you apply deductive and inductive reasoning? 19. Do you have the ability to listen and understand information giving to you through spoken words and sentences? 20. Do you have the ability to understand the speech of another person? 21. Are you OK with the idea of entering, recording, or maintaining information in written or electronic form? 22. Can you effectively get all the relevant data through observation? 23. Are you OK with analyzing and evaluating information to solve problems? 24. Are you interested in dealing directly with the public? 25. Are you OK identifying information by categorizing, estimating, and detecting changes in circumstances or events? 26. Are you OK having telephone conversations every day? 27. Do you like the idea of having face-to-face discussions with individuals or teams nearly every day? 28. Are you OK being in constant or near to constant contact with others? 29. Are you OK with the idea of your decisions having very important impacts on other people or your employer? 30. Are you OK working in a closed vehicle nearly every day? Police officers and detectives spend their days in an office, writing reports and maintaining records, and out patroling in their jurisdiction. There is a high level of stress associated with police work and in addition to the mental stress, there is often a high level of physical activity involved. is the average earnings for police and detectives per year. The minimal educational requirement to become a police officer or a detective is a High School education. Some positions require 1-2 years worth of college level classes or even a college degree. Recruits usually train through the police academy or a State academy. These training sessions often last 12 – 14 weeks. Police officers protect the lives and property of citizens. They pursue criminals and issue citations or give warnings to those found breaking the law. Most police officers have a jurisdication they spend a portion of their day patroling. They also write reports and record the events that take place. Police and detectives earned between $34,170 and $100,560 per year as reported by the Occupational Employment Statistics survey program. According to the BLS.gov, police and detective careers are expected to increase by 4% between 2014 and 2024 which is slower than the average occupation. Local and state budgets are the primary reason for the low growth of this career field. Discover the ideal abilities and skill set for individuals in the police and detective career field from the table below.